In 2003 the Trustees approved awarding student assistance awards to students in need of financial assistance who are enrolled in full time studies. Each year the Trustees receive hundreds of applications from students requesting support for their studies. Students are asked to answer a number of questions in detail and an essay with a minimun word count telling the judging Trustees about themselves and explain how the assitance money would benefit them, and how their life and education will benefit society. Applications are accepted each year from eligible students who are 30 years or younger, enrolled in full-time post-secondary education and who currently works or has worked in the film industry for a minimum of 1 year, within the past 6 months, or you have a parent/grandparent who currently works or did work in the film industry for a minimum of 3 years, within the past 6 months (or is a retiree with 5 years of industry employment prior to retirement )are eligible to apply for the scholarship. Click Here to read full rules and regulations before you apply. 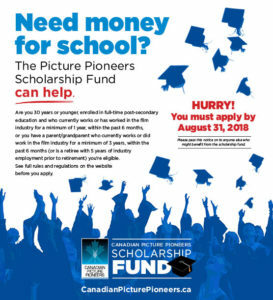 Contact the Canadian Picture Pioneer office for additional information regarding the Canadian Picture Pioneers Student Assistance Program. The students listed below were selected to receive awards from the Canadian Picture Pioneers Student Assistance Program. Check back in Summer 2019 for next application cycle. Read the detailed Rules and Regulations before you apply. Application deadline date: Will be posted when the application process opens for 2019. 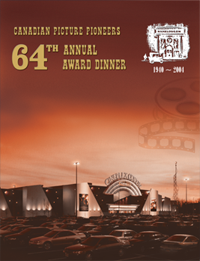 Awards will be announced after judging has been completed in the Fall of 2019. Note: This award is geared towards students in financial need.